The revenue cycle is impacted by virtually every aspect of the healthcare continuum – from the time a patient makes an appointment, to the care received, up until the time the bill is completely settled. An organization’s ability to proactively manage what happens in that period of time can have a direct impact on its profitability. Conversely, failure to do so can jeopardize an organization’s future. It is becoming increasingly clear that to prosper in these uncertain times, organizations need to automate their RCM as much as possible. The most successful forms of automation can help lower your staff costs, enhance clean claims rates, cut denial rates, improve patient collections and reduce bad debt – all contributing to enhanced profitability, improved financial outcomes and, potentially, improved patient satisfaction. 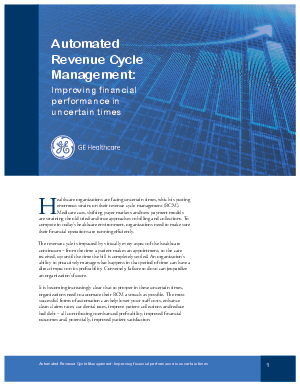 This whitepaper will share examples of how automation has been proven to improve RCM measures, and even small improvements can significantly impact the bottom line.